Life takes strange twists and turns, and the past three weeks have been twistier than usual.Looking at my situation from the outside, things look pretty dire. Being basically homeless at my age is no fun at all. The old brick foundry building sits just above the railway tracks in a commercial and industrial part of Durban. Factory buildings line busy Umgeni Road and the ubiquitous taxis zip around, horns honking as people duck through the heavy traffic. Cars are parked wherever they can find a spot. Informal traders dot the pavement, selling anything from t-shirts to big, juicy mangos and bunches of fresh lichis. The area literally vibrates with energy. And this is what distiller Andrew Rall of Distillery 031 is tapping into and enhancing at KwaZulu Natal's first craft distillery. This tall (very tall) young man exudes enthusiasm equally about his business and Durban and separating the two is next to impossible. 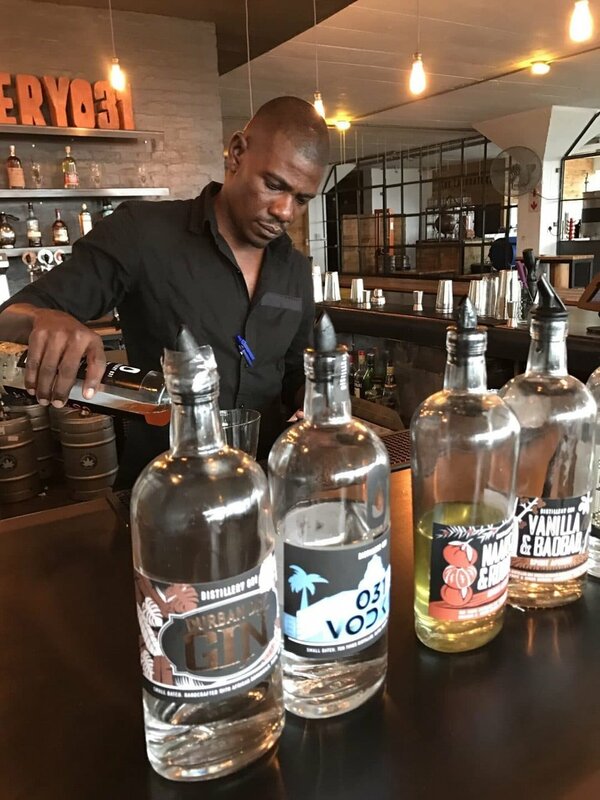 The whole mission behind Distillery 031 is the fusion of the Urban Durban vibe into the unique spirits he is creating in the big, old industrial building. From a surfer boy who "majored in drinking" at university where quantity topped quality, to an accomplished entrepreneur with not just the distillery but a couple of other businesses, which help pay the bills, has been quite a trip. He discovered craft distilling in Scotland and realized that there is far more to drinking than he knew. That revelation led to his exploration into rum, his favorite spirit, where he tasted Mount Gay, the rum I grew up on while in the Caribbean. This started him thinking and wondering why South Africa didn't produce rum, with the huge sugar can industry here. On his travels, Andrew visited the United States, collecting rum along the way. On his return to South Africa, he and five friends decided to start distilling, as he recognized rum as an emerging trend in the liquor industry. What started as AARGH! rum, originally intended as an importing venture, has turned into much more. Once his friends realized how much work is involved in distilling, they quickly fell by the wayside. But Andrew persevered, slowly graduating to bigger stills and taking up more and more space at his home, eventually taking up his garage and carport. Then he got married and decided to provide the alcohol for the wedding, "to test it out and make sure nobody died!" Needless to say, it proved very popular and that's when it started to get too expensive to remain a home distiller. In South Africa, home distilling is permitted but the liquor cannot be sold. "It's limiting how much gifting you can do before you bankrupt yourself," Andrew declared. Not long after that, Simone, his wife handed him an ultimatum. He must either stop or "do it properly" as she needed her carport! So he started the process of perfecting his recipes and Simone asked him to create a gin as she is not a rum fan. Initially, Andrew was against it as his idea of gin was something his grandparents drank and as he put it, "a horrible juniper forward punch you in the face kind of thing!' Until he tasted a craft gin and was converted. During this time, he discovered the old foundry building. For Andrew, it's not just about making great spirits; it's about building a community in The Station precinct (Distillery 031 is on Station Drive.) When he took on the building, he knew he would need to create rental spaces within it, to help pay the bills, as it took 18 months to become licensed. On the ground floor now is a thriving brewery, S43 Home to That Brewing Co. Up the concrete stairs on the first floor live the creatives - jewelry and clothing designers. Next floor is the distillery and very trendy restaurant. The top floor, which is reached via either an outside steel stairway or the inside stairs are the offices. A neighboring building is also experiencing the benefits of urbanization and revitalization with small stores and a cafe. When you read the names of the spirits from Distillery 031, they are so unique to this part of the world. And the ingredients included in many are indigenous to this area. All are distilled from local molasses extracted from KZN sugar cane, except the Agua Zulu Cachaca, which is distilled from the juice of freshly crushed local sugar cane. The Durban Dry Gin, Distillery 031's signature gin, with 10 botanicals includes the indigenous African Rosehip which gives it it's distinct floral character. Pair that with 031's own tonic, created by Andrew from an old Victorian recipe, and you have a G&T like you have never had before. Simply delicious! The two spirit aperitifs, Vanilla & Baobab, and Naartjie (similar to a tangerine) & Rooibos, both crafted from 10 times distilled 031 Vodka, impart a distinctly African experience! Absinthe has quite a history and Ancestor Absinthe is adding to it. Using a traditional French recipe but using indigenous botanicals including impepho, which is used by traditional Zulu herbalist. As Andrew says, "In Europe you drink Absinthe and see green fairies. Drink our Absinthe and see your ancestors." 031 Vodka is named for the Durban's telephone area code. You can't get more local than that. One of the reasons I am here in South Africa is for a family reunion of sorts. With my brother Michael, or Mick as he is known, living here in Pietermaritzburg and where I have stayed on past visits, it is the logical place to gather. Sister Rosemary, or Zoze (yes we all have nicknames!) came in from New Zealand so now there are three. With just three days left here in the Pacific Northwest, and when scanning Jim and Mardelle's downstairs apartment where I have been roosting since I left my house, I think I am going to meet my goal of walking out of this old life with one suitcase and a backpack. This was probably the worst storm I have experienced in this house. The rain was literally blowing sideways! As I go through my stuff and go keep-discard-discard-discard, and look at and feel each thing, the memories surrounding it rush back and worry my decision-making abilities! Often they are wonderful memories, other times I am happy to toss them. Others are just sad and I find myself in tears. Take all my kitchen stuff as an example. I've gathered specific utensils at various times, like the three French tart pans with removable bottoms. They were, at the time, hard to find and expensive! That was when I wanted to start a tart company and was making various combinations day in and day out, trying out different pastries and combinations. I can still see them and smell them and remember sharing with friends, asking for opinions and favorites. My French tart pans are difficult to give up - especially when filled with a savory delight! And there is the little tiny garlic chopper that Ryan and Les gave me for Christmas one year and that I use regularly. It's tiny so will probably keep it...tucked away in a box that I may or may not ever see! The uncertainty is ever-present as I sort through things. When I get sad about things I have to get rid of, it's hard to keep the positive images in front of me - South Africa with good times ahead with family and friends; then on to Belize. Sun, beach, warm... so I am grateful to my friends here giving me moral support! I have resisted using craigslist to sell stuff and instead, have used the Facebook local marketplaces which are proving to be amazingly successful! And the fun part of that, is very often when someone responds or buys an item, there is a personal connection! As an example, Michelle who messaged me about the big "marital" bed (yeah, memories there, some I definitely prefer to forget) works with a friend of mine! And a couple who bought my mixer and food processor live next to John and Danelle, Susan's daughter. So it does make it easier, knowing where things are going and that they are going to good homes! And also people I haven't seen or heard from for years are popping up. Patti, who was our office assistant in real estate is coming over on Wednesday to have coffee and pick up a couple of things she wants. So the connections are good and fun, helping to make this transition a bit easier. Next weekend, I will have a garage sale and get rid of as much of the small stuff, then take what's left to Goodwill. 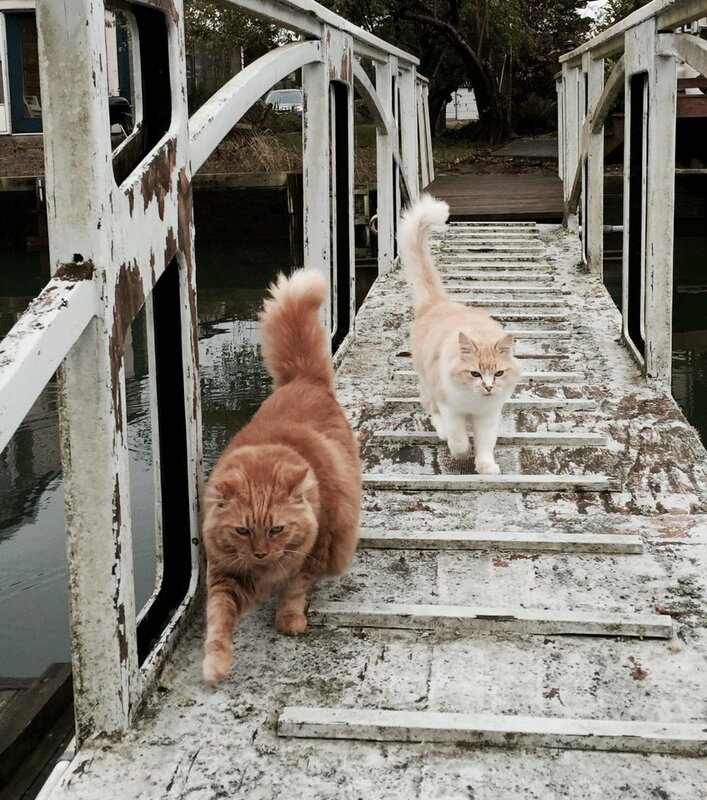 Nothing is easy about finding the boys a home but things are looking up, a good thing as they know something is going on. Maria is coming today to meet them. No coincidences, right? A friend saw the posting and told her about Hinckley and Buddy. She immediately contacted me as she had planned to go to the shelter this week to adopt two older kitties! She sounds really nice, a total cat person and understands how hard this is. So more on this after I go to check out her place tomorrow, as long as today goes well, which I know will. The rest of my life is pretty much at a standstill as I work through this move/transition. But I am writing this on my new MacBook Pro! Finally have a system that all components speak the same language. Even though the screen is quite small compared to the big monitor I had been using, with the Retina display, it is easy to work on and very easy on the eyes. Oh, and my iPhone 7 Plus is on its way! I will be a total Apple person! We've just weathered one of the worst storms I have experienced in this house, so my timing is perfect to get the hell out of here.